It is difficult to evict from one's mind the TV images of helpless men, women, and children hanging on to branches and just about anything else as torrents caused by the monsoon rains threaten to sweep them away. Imagine what it is like for those who were actually there. 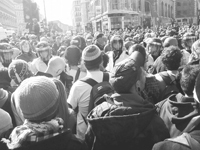 Food insecurity may cause unrest or even political instability. Persistent food insecurity may cause conflicts, civil wars and can threaten the overall peace of a community, society, or world depending on the extent and spectrum of hunger and poverty. The term reflects the desire to eliminate hunger and malnutrition. The World Food Summit in 1996 defined food security as, 'when all people at all times have physical and economic access to sufficient, safe, and nutritious food to meet the dietary needs and food preferences for active and healthy life'. This definition implies that food security has three pillars i.e., physical availability, socio-economic access, and food absorption. James Tobin, late American Economist's suggestion of 'throwing sands in the wheels of international finance' by taxing currency trading has become a vociferously advocated initiative in the post-crisis discourse on reformative regulation. The call is worthy to take a close look, as it emphasises the need for this tax in the context of 'elusive' capital while fiscal deficits are compounding human development deficits. With high debts with major governments, we believe that leveraging liquidity is desirable and hopefully, the political will is not ossified. Agriculture being the main pillar on which our economy rests, it employs abut 50 percent of country's population and accounts for more than 20 percent of the country's GDP. It is an important driving force behind the economic growth and poverty reduction in rural areas where it affects about 70 percent of the population. Therefore, the problems faced by our agriculture sector can easily be stated as a danger to our economy. 'Acha, yahan bhi constitutional amendments chal rahe hain,' observed a friend, scanning headlines in The Daily Star as we waited at Dhaka International Airport for a much-delayed flight to Karachi. Her comment about 'constitutional amendments going on here also' highlighted something that's always struck me as curious: the bizarre parallels of Bangladeshi politics with Pakistan, since Bangladesh gained independence from Pakistan in 1971. A curable disease, tuberculosis, is creating serious socio-economic implications for Pakistan despite the fact that the country has in place proper facilities in all its districts for the free treatment of TB patients. At the number 177/100000, Pakistan harbours 1.5m TB patients or 43 percent of the total TB cases in the Eastern Mediterranean region of WHO. It ranks seventh among 22 countries that bear 80 percent of the disease burden in the world. Some 40,000 new TB patients are detected in the country every year; while two-thirds of the total TB patients are found in the older age groups, creating serious socio-economic implications for Pakistan. As we are going through the warmest year on record, many concerns have risen across the globe regarding 'cooling the planet'. Even climate sceptics are coming round on the phenomenon of global warming. In the sweltering heat of summer, just imagine the predicament is going to get worse. The situation is even grimmer for urban dwellers. By the time we reach half way through the 21st century, cities shall grow even hotter, with city residents experiencing more than 5.6C hotter nights as compared to what we experience today. According to a research, based on computer model projections, published in the journal Geophysical Research Letters, there shall be an increase in temperature of about 3C during daytime both in rural and urban areas but at night cities will get much warmer than rural areas, almost up to 3C in the Middle East. We face a question at home and abroad, Why Pakistanis do not pay their taxes and how come that tax-to-GDP ratio of the country is one of the lowest in the world? We try to explain a host of reasons for this perplexed situation. The Pakistani state and the common man are facing a major crisis in the shape of the war on terror. The issue is critical and serious for us because the war has totally shifted from tribal areas to urban cities like Lahore, Karachi, and Islamabad. Currently, Punjab is being targeted from non state actors as they try to destabilise the biggest province of country in terms of population. It seems as if this ill-fated country simply stumbles from one human disaster to the next, mostly of our own doing. Even the present spate of flooding is not a simple case of the elements conspiring against us; there is clear evidence that the denuding of the environment over an extended period of time is now coming back to haunt us. It can be argued that the Peshawar Valley has not experienced rains like this before. But at the same time there can be no doubting that the Swat river in the past has been awash with flood water from the hills but on this occasion the volume of water was too much due to the lack of forest cover. Who cut all the trees down? Meanwhile the federal capital itself, and posh sectors such as F-10 at that, were completely incapacitated. It does not take a rocket scientist to recognise that the tremendous changes in the eco-system of the city in recent years must have had some effect on its ability to cope with torrential rains. Local reporters in the federal capital had been filing stories for days before the rains came warning that the Capital Development Authority (CDA) had made no preparations for an extended period of precipitation. As it turned out Rawalpindi's administrators were probably better prepared for Nullah Leh's rising water levels, although there was still not inconsiderable damage suffered by innumerable Pindiites in the inner city. The pitiful state of foresight and preparedness aside, it is striking how little coverage there has been of arguably much more serious monsoon floods in eastern Balochistan over the past two weeks or so. Perhaps most notable was the lack of TV images in stark contrast to what was beamed into our homes on Thursday and Friday from Nowshera and its environs. Surely, this should get us thinking? And then there is our heroic army. And here I include the National Disaster Management Agency (NDMA) which is headed by an army man (although that hardly makes it a unique government department). When asked a series of somewhat challenging questions about the NDMA's response to the floods by a prominent TV anchor, the honourable general insisted that his agency's performance was impeccable. He also noted that the NDMA is a 'policy-making' entity and it is up to the provincial authorities to actually make things happen on the ground. Funny how army men always conveniently delegate responsibility after the fact, is it not? For all of the hyperbole that circulates in official circles about the army's stellar record in responding to emergencies, the evidence in recent times suggests that the men in khaki do a terrible job in coordinating disaster relief operations; it was reported in the immediate aftermath of the airplane tragedy that troops that eventually made it to the crash site cordoned the entire area off and succeeded in rendering all volunteer relief efforts completely useless. Finally, a note about what I earlier called an 'ill-fated country'. Perhaps fate is a word to be avoided given the insistence of so many ideologues on Pakistan being part of a divine plan to save global Islam. Even so over the past few years the sheer number of things that have gone wrong for this country (read: the ordinary people who inhabit it) is staggering. It cannot be denied that many of the crises that have unfolded are squarely a function of the so-called 'war on terror' and, for that matter, the machinations of imperialism since the inception of the state. But there are serious 'indigenous' matters that we have yet to deal with, the most obvious of which is the identity of this 'nation-state'. Are we a nation? Why do Baloch deaths not garner as much coverage as Pakhtun or Punjab deaths? We must answer this question, and soon, without continuing to attribute all of our ills to the proverbial foreign hand. As for the perennial crisis syndrome, it could be that we have just become too easy a prey for an electronic media which has become completely obsessed with 'breaking news'. While only a foolish man would be willing to suggest that Pakistan has not experienced a disproportionate number of economic, political and ecological crises over the past few years, the fact of the matter is that a large number of people in this country continue to demonstrate unflinching resilience in the face of all that is unfolding around them. While ordinary people's capacity to deal with problem after problem should not be romanticized it is also worth thinking about the extent to which the electronic media dictates public sentiment, particularly in urban areas. In the final analysis, the floods that have wreaked havoc in the north of the country in recent days have simply reinforced the pessimism that many Pakistanis harbour about the direction of this country, while convincing those who are alienated that they are right to be demanding a complete break from the land of the pure. I continue to hope and believe that one of these never-ending series of problems might actually trigger a chain reaction that culminates in something much better than what we have on show at present. I admit to feeling apprehension that there is likely to be much more conflict before a resolution, but I also know that this does not prevent me from feeling optimistic all the same. The Italian thinker Antonio Gramsci wrote famously about the meeting of the pessimism of the intellect and the optimism of the will. I leave it up to the reader's imagination to decide who would win that contest. In a report jointly released by World Food Programme and Sustainable Development Policy Institute's Sustainable Development Conference titled, 'Food Insecurity in Pakistan 2009', it is observed that state of food security in Pakistan has deteriorated since 2003. The conditions for food security are inadequate in 61 percent districts (80 out of 131districts ) of Pakistan. This is a sharp increase from 2003, when conditions for food security were inadequate in 45 percent districts (54 out of 120 districts) of Pakistan. In terms of population almost half of the population of Pakistan (48.6 percent) doesn't have access to sufficient food for active and healthy life at all times. The report comes up with substantial evidences that inter and intra provincial disparities exist in terms of food security. FATA has the highest percentage of food insecure population (67.7 percent) followed by Balochistan (61.2 percent), and Khyber Pakhtunkhwa (KPK) (56.2 percent). The lowest percentage of food insecure population (23.6 percent) is in Islamabad. Among the districts, Dera Bugti has the highest percentage of food insecure people (82.4 percent). Balochistan has the maximum number of districts with worst conditions for food security. The 20 districts of Pakistan with worst conditions for food security include 10 districts from Balochistan, 5 from FATA; 3 from KPK; and 1 from Gilgit-Baltistan and Sindh each. The number of districts from Balochistan in this category has doubled since 2003. Dear Bugti, Musa Khel, Upper Dir, North Waziristan, Kohistan, Mohmand, Dalbidin, South Waziristan, Orakzai, and Panjgur are the 10 districts with worst conditions for food security in Pakistan. Islamabad Capital Territory is the most food secure district of Pakistan. Among the top twenty districts with best conditions for food security besides Islamabad, 14 districts from Punjab and 5 districts from Sindh are included. There are two major sources of food; one is crop based while other one is animal based. Physical availability of food is determined on the basis of 'consumption versus production'. Six percent increase in surplus wheat producing districts (from 24 percent in 2003 to 30 percent in 2009) and 1.4 percent increase (from 35.8 percent in 2003 to 37.2 percent in 2009) in animal food surplus districts was observed from 2003 to 2009. However, the percentage of surplus food (aggregate of both animal and crop based food) producing districts declined from 28.3 percent in 2003 to 17.5 percent in 2009. This means that majority of districts in Pakistan are either relying on external food supply either from domestic or international sources. This reliance occasionally creates disparity of prices in food surplus and food deficient regions. At times, this also results in hoarding of food leading to food price hike, thus taking food beyond the economic access of many. This phenomenon is also supported by the observation that consumption of wheat in Pakistan declined by 10 percent in 2009-10 due to lack of purchasing power. It can be safely assumed that ensuring food security is much beyond increased wheat production. Access to food was determined by Food Consumption Score (FCS), household income, child dependency ratio, living conditions, food expenditures, market prices of food commodities, and coping strategies. The percentage of districts with adequate conditions for reasonable access to food was not very promising in 2003. Only 13.3 percent i.e., 16 out of 120 districts had adequate conditions for reasonable access to food. However, this situation seems to be further aggravated in 2009 when only 7.6 percent districts (10 out of 131) fell in the category of having reasonable conditions for access to food. Conditions of access to food in Balochistan have gone worst since 2003. In 2003, the 20 districts in Pakistan with worst conditions for access to food included 8 districts from KPK, 4 from FATA, 3 each from GB and Balochistan, and 1 each from Sindh and Punjab each. Now (iIn 2009), this category includes 16 districts from Balochistan, 3 from KPK and 1 from Sindh. Provision of adequate conditions for reasonable access to food merits immediate attention of policy makers and international community as 25 out of 29 districts in Balochistan, 5 out of 7 agencies of FATA, 12 out of 24 districts in KPK, 8 out of 23 districts in Sindh, and 5 out of 34 districts in Punjab has extremely poor conditions for access to food. It is pertinent to note that 4 out of 5 districts with extremely low conditions for access to food in Punjab fall in Southern Punjab. With the increase in poverty, people spend more on food as compared to non-food items. Within the poorest group, the average household's expenditure share on food has gone up to 61.6 percent in 2009 against 55.6 percent in 2005-06. The most common coping strategy both in urban as well as rural areas is to rely on less preferred and less expensive food. The second most adopted strategy is limiting the size of meals. Negative coping strategies lead to chronic food insecurity. The third pillar of food security i.e., food absorption was measured through state of sanitation, drinking water, and female literacy rate. Only 9 percent districts (11 out of 120) met prerequisites for reasonable food absorption in 2003, this situation got further deteriorated in 2009 when only 7.6 percent (10 out of 131) districts in Pakistan met these prerequisites. One quarter of the total districts in Pakistan has extremely poor sanitation facilities where more than 50 percent of houses are without toilet. Similarly, one quarter of the total districts has extremely poor state of drinking water where more than 50 percent households have no access to clean potable water. Almost a quarter (23 percent) of the districts have an extremely low female literacy rate (10 percent or below). FATA with 6.2 percent female literacy rate is the worst. All of the above-mentioned figures reveal that individual security in Pakistan has deteriorated from 2003 to 2009. There are four levels of security, individual, national, regional, and global. All four are interconnected and ignoring any one of them may threaten rest of the three levels of securities. One can try to understand the insurgency and militancy in Balochistan, FATA, KPK and 4 remote districts of Southern Punjab from food security angle. Although there is no empirical evidence to prove that food insecurity is the only cause of militancy in the above mentioned parts of Pakistan, yet it is an established fact that food insecurity leads to violence and conflict. Based on a similar report of 2003 SDPI has warned that KPK and FATA would be the hotspots due to food insecurity-militancy nexus. Now we are warning that Balochistan and Southern Punjab are also slipping out of our hands, individual security in these districts is threatening state and regional security. Coping with growing food insecurity is a daunting challenge for the government of Pakistan that has to prioritize its limited resources amongst defense related expenditures (to curb militancy); debt retirement; day to day administration; and public sector development However, the potential militancy-food insecurity nexus cannot be ignored in Pakistan and requires a change in paradigm where food insecurity should not be treated merely as a humanitarian issue, but a national, regional and global security issue. It is about time that a National Food Security Strategy must be evolved. We suggest that the primary focus of such a strategy should be ensuring food security in extremely food insecure districts. Resources channelised to improve the food security situation at the local level are critical to improve development and security at province, national and regional level. It looks like that the country is paying its price for having neglected food security. The G 20 committed a stimulus package equal to 1.1 percent of the world's GDP to resolve the global economic crisis at the London summit in April 2009. Boosting IMF resources by $ 1.1 trillion in line with this aim was also declared. A rescue package of a trillion dollars has been committed by the European Finance Ministers in May 2010 to deal with the current European crisis. The successive meetings of the G 20 find the group waning on the promise and purpose of stabilizing the global economy -- one reason being the elusive 'trillion' and the successive ones that must follow to walk the talk. The spending needs by the government seem to be in a fierce competition with the need to save. At the most recent G20 summit at Toronto, nations jointly decided to reduce deficits as a priority and gradually pull back their stimulus spending. This stance may translate to a conscious economic contraction. Never before in global economic policymaking has the need for saving and spending been felt as acutely and simultaneously. The costs of solutions to American and European economic problems stand calculated with the world's mightiest economies desperately looking for fresh funding sources. Such collective effort has never been deployed to address financing key human development challenges of literacy, health, nutrition and employability in the developing world -- issues which are as important, if not more as the concern for social security in Italy and Greece. The G20 governments must find capital for growth as well as human development to have lasting sanctity and public acceptability. Contrary to popular perception, the world has not been left dry without liquidity, nor is global capital concentrated in an emerging Asia alone, much as the world believes that all dollars rest in Chinese vaults. Much capital travels across the globe translating into liquidity many times over. Political will is needed to recognise drivers of global capital and liquidity and therein leverage critical finance for human development and growth. A look at trade across currency and forex markets is warranted, where untouched by the recession, money yet moves full steam globally. Recessionary impacts do not gravely affect forex markets unlike the stock and bond markets. Daily currency trade is yet about $ 3 trillion -- closer to the last official figure provided by the BIS (2007) of an average daily trade of $3.2 trillion. In this context, the Tobin Tax appears very desirable which concerns taxing spot currency transactions at a nominal (0.5pc) rate. The key objectives as proposed were to facilitate monetary policy autonomy to national governments in face of destabilizing capital movements and to raise critical capital for international development goals. As per our calculation, even at 0.25 percent, half of the suggested 0.5 percent, the tax can annually raise $ 3 trillion globally. This is more than $ 1.1 trillion 'committed' stimulus by the G20, the $ 1 trillion 'needed' by Europe currently and the total of ODA, all put together. Compelling reasons for such taxation, apart from current financing needs are presented, which will go a long way in absorbing future shocks and preventing fiscal bankruptcies. A study by Harvard economists Frankel and Saravelos looking for the most prevalent and explanatory factors preceding a series of crises in the '90s found exchange rate fluctuations as the key one. Generally, with an increase in capital moving in a country, there is currency appreciation making exports expensive and creating an inflationary spiral. When the money flows out, currency depreciates, creating balance of payments problem. Even in the absence of major fluctuations (read crisis) such as in Argentina (2001) or Thailand (1997), a general and undesirable nervousness over moderate disturbances persists in developing countries. Economic theory postulated that exchange rate changes will lead to reallocation of productive resources and the balance of payments will automatically stabilise. Exactly the opposite has happened with capital moving overnight, affecting currency values and creating volatility with speculative attacks. Needless to say most developing country governments have not been able to maintain autonomy in this sphere. They can, as per the famous trilemma, choose only two of the three from among: fixed exchange rates, free capital movement and an independent monetary policy. The current financial trade regime greatly limits governments' authority in regulating capital or controlling their exchange rates. 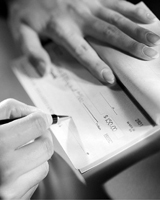 Tobin Tax can play a key role in dealing with volatility and speculative attacks. Written off for different reasons, discussions on the tax have an interesting political precedent in the US. Introduced in the second session of the 104th congress, a bill titled Prohibition on United Nations Taxation Act of 1996 successfully prevented UN led discussions on the Tobin tax. There is no other example in history where the ideas of an economist have been prohibited from discussion by legislation even as dissent has been a norm across key American academic centres. Even with the phase of uni-polar world order having passed, multilateral political acceptance is a challenge together with other minor ones for bringing in a taxation regime as this. A cooperative G20 stance can help ease the problem emanating from a selective and/or unilateral imposition of the tax and also address the challenges of accounting and implementation. The latter are smaller hindrances given that final clearances happen only in key markets and the trade is now internet based and can be followed with ease. There is no reason why the G20 countries including India which has close to $ 30 billion of daily foreign exchange turnover should not come together and create a movement for this possibility. The UN should ideally govern and manage the process with the support of the G20 and its Financial Stability Board. Tobin originally proposed the IMF as the administrator of the tax. However, given the widespread criticism of explicit partiality to developed nations' role and participation in the IMF, a UN agency or perhaps a fresh UN commission is the best institution to initiate the idea. There are many factors that serve as impediments to the growth and development of agriculture sector, such as low productivity of crops, inefficient use of agricultural inputs, including fertilizers, ineffective transfer of technology to the farmers, inefficient use of water, post-harvest losses and poor market infrastructure. But the most dangerous of all is the degradation of land resources by water-logging and salinity. In Pakistan, a total of 5.88 million hectares of land is unproductive due to these two problems. 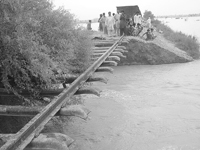 Pakistan has one of the world's largest canal-based irrigation systems. Although the importance of this irrigation system cannot be denied but everything has its disadvantages too, and in this case it is water-logging and salinity. The main purpose of perennial canal irrigation is the supply of water throughout the year; and this is also its main problem. As water is supplied throughout the year, it constantly seeps through unlined canals and irrigated fields. This constant supply of water is more than that can be lost by evapo-transpiration and thus the water table rises causing water-logging. As water rises, salts in the soil are dissolved in it and carried to the surface. The water, on reaching the surface evaporates and the salts form layers at the top; this is salinity. Efforts to combat these problems continue but little progress seems to have been made in this regard. Under the Biosaline II programme, headed by the United Nations Development Programme (UNDP), with some financial help from the Government of Punjab, an effort is being made to deal with the problem effectively. The project aims to reclaim lands lost to water-logging and salinity in three districts of the Punjab, namely Sargodha, Jhang, and Hafizabad, which over an area of 80000 hectares. 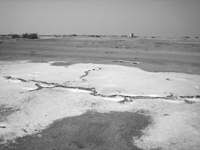 The saline land is covered with gypsum which reduces its salinity and increases crop yield. Community Organisations (COs), under the names of Salt Land User Groups (SLUGs) and Women Interest Groups (WIGs) for men and women respectively, have been established with its members responsible for helping and managing the entire population of a village. 'Our long term aim is to establish a sustainable agricultural farming system where community organisations are in the driving seat so that once our work is done; they can carry on by themselves and don't need us anymore. So far, 650 COs have been set up,' says the Monitoring and Evaluation (M&S) specialist, Mahmood-ul-Hassan. Installation of tube-wells is another major way in which this project tackles water-logging. Tube-wells pump water from under the ground and supply it to the farms, thus lowering the water table. Not only do tube-wells decrease the danger of water-logging but they also supply farms with water in a country where its availability is a great problem. Some areas have been damaged so badly that they cannot be recovered. In these areas, with the help of the UNDP, farmers have established fishponds so that land is brought to use in some way. Due to high initial cost, only a few farmers decide to convert their lands to ponds and thus this activity is not very successful. The project faces many obstacles which are common to all development programmes in this country; political instability, insecurity and hostility towards the projects headed by foreign organisations. Other problems include the procurement of gypsum due to consistent load shedding throughout the year. Despite these problems, this project is a good example of rehabilitation. However, the irony of the project is that it only focuses on 2pc of the total area in Pakistan affected by water-logging and salinity, and 6.25 percent of that in Punjab. It is obvious that this is a very small area and thus, new projects like these should be started not only in Punjab but also in Sindh where the situation is equally critical. Research should be done and the existing methods of combating these problems should be used as well. We've had prolonged periods of military rule and short-lived elected governments, the constant battle between those trying to conduct politics through religion and those struggling for democratic values, and now, as my friend commented, attempts to purge the constitution of amendments imposed by military dictators. We've seen political assassinations of popular leaders Mujibur Rehman, killed by army officers in 1975, and Z.A. Bhutto, hanged by a military ruler in 1977; military coups by the Generals Zia (Ziaul Haq in Pakistan, 1977 and Gen. Ziaur Rehman in Bangladesh, 1981); spirited struggles for democracy led by the assassinated leaders' daughters (Sheikh Hasina, Benazir Bhutto); and 'train marches' (in 1994 by opposition leaders (Nawaz Sharif in Pakistan and Sheikh Hasina in Bangladesh). A recent UNDP report on the Multidimensional Poverty Index (MPI) places Bangladesh at 73 out of 104 countries, one step better than India's 74, and only shortly behind Pakistan's overall 70. In education, Bangladesh scores better than India, Pakistan, and Nepal. A whopping 89 percent of Bangladesh's poor households' children attend school. It's the other way round in Pakistan. Bangladesh followed in Pakistan's footsteps in making Friday the weekly holiday instead of Sunday (despite protests by the business community). However, it has not managed to reverse the decision, as Nawaz Sharif in Pakistan did when he was Prime Minister. There was not a squeak out of the religious lobby when Sharif made this move (imagine the uproar if Benazir Bhutto had done it). But the weekly holiday issue is minor compared to the kind of laws enacted by dictators in Pakistan in the name of religion. Fortunately, so far Bangladesh has not capitulated to pressure from the religious right wing to declare Ahmedis as non-Muslims, or introduce the kind of blasphemy law that General Zia pushed through in Pakistan. Sections 295-B (defiling the Holy Quran) and 295-C (defaming the Prophet Mohammed, peace be upon him) were added to the original Section 295 of the Pakistan Penal Code that dealt with penalties for outraging religious feelings. Since the addition of Sections B and C (that respectively prescribe life imprisonment and death for convicts) not only have these laws been used to settle scores but numerous alleged blasphemers have been killed -- lynched by mobs, shot dead by zealots, on the streets, in police custody, in court premises. (In the most recent case, two Christian brothers were shot dead in Faisalabad as they were being produced in court for alleged blasphemy). As with blasphemy laws that have led to widespread abuse, Bangladesh's special laws against acid attacks have contributed, say lawyers, to a rise in acid attack cases (mostly on women) and to a new set of abuses such as the case of the man who threw acid on his own wife in order to frame someone he had a feud with, whom he then nominated in the first information report (FIR). Both our governments claim to be democracies but continue to use undemocratic practices to crush political dissent or differences of opinion. The poor in both countries continue to barely eke out an existence for themselves. 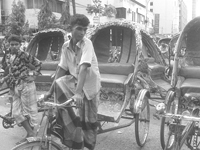 Many of Dhaka's bustling streets are now off limits to the ubiquitous cycle rickshaw with its distinctive 'rickshaw art' that is akin to Pakistan's 'truck art'. However, they are still very much visible (policemen are known to puncture their tyres with nails attached to sticks if they cross their boundaries). Intriguingly, the green CNG-powered auto rickshaws are protected by steel grills that serve as a protection against the muggings that frequently took place, we were told. As the PIA plane took off, soaring over the flat, verdant fields dotted by still bodies of water mirroring the monsoon skies, another parallel between our countries struck me: the remarkable resilience of our people who continue to fight on, and who will one day, prevail. Then we'll hopefully have a more positive set of parallels to compare. High prevalence of TB among persons of what we call productive age groups is a cause for great worry. There can be no denying the fact that this curable disease, if not tackled appropriately, causes devastating effects upon not only the affected families but also the state and society. This brings to the fore the need for addressing the problem urgently. However, it is satisfying to note that, at present, the access to TB coverage in Pakistan is 100 percent and the case detection rate (CDR) in the country has also increased to 74 percent from 30 percent at the beginning of this century. Still, the country has to go a long way, especially due to social stigma attached to the disease and the widespread practice of self-medication in the non-formal sector. When remedies offered by elder people do not work, only then patients go to the nearest drug store or to the service provider. In the case of rural areas, most of the service providers are informal practitioners. Even if the informal service providers happen to diagnose the disease, evidence suggests that majority of them do not refer patients to public diagnostic centres due to the fear of losing their patients. Doctors and researchers face a difficult task. But, if concerned stakeholders could succeed in enlisting the support of society they can surmount difficulties and considerably reduce the burden of the disease. For enlisting the support of society, a well-planned public awareness programme should be launched about this disease among the masses and motivating patients to come forward for treatment. The need for creating awareness about the disease is acute in a society where, as per findings of a 'Knowledge, Attitudes and Practices' (KAP) study, conducted by the National TB Control Programme in two cities sometimes back, only one of 245 physicians are aware that cough for longer than three weeks is the main symptom suggesting pulmonary TB and that less than one percent of doctors relied on sputum smear microscopy for diagnosing pulmonary Tuberculosis. In view of the findings of this study, it is also imperative to increase the awareness level of General Practitioners (GPs). It carries sense spending thousands in providing information to the people about the availability of services and how to access them. After mobilising the society, the next important step is to motivate patients and their families to report at the treatment/diagnostic centre nearest to their home for availing the benefit of free treatment. However, a word of caution, unless messages for this segment of population are prepared and launched keeping in view the common demographic and geographic characteristics of the target groups, these messages might not succeed in yielding the desired result. If an organisation is doing a good job, it must also get due credit for that. Presently, according to knowledgeable persons, the dissemination of information pertaining to TB control programme is restricted to the concerned official quarters only. Unless the good work done by an organisation is communicated to the people, how would they know about it? Dissemination of positive information ultimately results in increasing the credibility of an organisation or a programme amongst the people. Of late, the government has also enlisted the support of some private service providers, offering them incentives like free medicines, etc, for TB patients under their treatment. With a view to motivating the private service providers and to enlist their support for recording and reporting of TB cases, service providers need to be given incentives, like offering specialised training to a few most dedicated doctors, etc. The print and electronic media, peer groups, in particular writers, clergy, teachers, etc; can also play a great role in disseminating information aimed at strengthening enabling environment. One often comes across people who advocate and practice group eating in giant-sized round-shaped plates. These groups also share water tumblers for drinking water one after the other. The peers need to be sensitized, at least, in regions of the country where TB is prevalent, to advise people to shun the practice of eating together in one plate or using one or two water tumblers by large group for drinking. There is also need to increase the level of political support available for carrying out this programme. The phenomenon of warmer cities is attributed to what we call 'urban heat island' which denotes that concrete buildings, metalled roads, and asphalt streets of cities, because of their building material, absorb more sunlight and radiate more heat back in air at night, thereby raising temperature of the area. Urban environment serves as heat reservoirs. Concrete can retain up to 2,000 times more heat than air of the same volume. Because of dense population of buildings the air cannot blow freely among the buildings and, therefore, heat is trapped. Emissions of air-conditioning and transport vehicles further fortify the heat. Therefore, the cities are hotter than their rural surroundings. Black or dark coloured roofs also absorb more heat and make the building warmer. Urban air also does not cool down even long after the sunset as the urban infrastructure keeps dissipating heat back into the air. Urban heat is cyclic in nature. When temperature rises, more and more is invested into air conditioning to cool down the ambience, thereby increasing the energy requirement. More power generation and consumption leads to pollutant emissions, including greenhouse gases, spiking warming even further. The phenomenon of urban heat island is extreme in dry and subtropical regions. On the other hand, vegetative surfaces (fields, grass and trees), water and soil absorb less heat and, therefore, have a cooling effect. The impact of urban infrastructure on urban climate was first investigated in the early 19th century. However, the phenomenon has been long ignored. The environmental and health impacts of the built environment holds special relevance for city residents and planners due to its pervasive impacts on energy consumption, human health, infrastructure planning and urban policy. The phenomena of global warming, climate change and ever-increasing global temperatures have renewed the interest of planners and community in urban heat island. The unprecedented heat during the summer 2010, all around the globe, coupled with atrocious long hours of electricity load shedding in Pakistan, makes the significance of urban heat island even more prominent. Currently 40pc of Pakistan's population lives in cities. According to United Nations Population Fund (UNFPA) Pakistan has highest trend of urbanisation in South Asia. Keeping in view the trend, around half of Pakistan's population shall be living in urban areas by 2030. It is estimated that population of Karachi will exceed 15 million by 2015, while Lahore and Faisalabad will cross eight million and three million-respectively. As cities of Pakistan grow in size, there will be more houses, more cars, more roads, more pollution and consequently more heat, besides host of other problems springing from rapid urbanisation. Electricity deficit is already making urban as well as rural life difficult and the projected warming trend in urban areas shall further worsen the situation. As cities grow warmer, electricity demand shall further increase, resulting in more stress on energy resources. Warmer cities affect health and comfort of the dwellers. We may expect more cases of heat stroke and heat-induced pulmonary and cardiac problems. Further health threats could emerge due to rainfall. Wet and warm conditions are more suitable for vector-borne diseases. It has become imperative to invest in cost-effective and feasible urban cooling strategies. Some of the solutions suggested by experts are: light coloured exterior of buildings, green parks/lawns, more trees around the buildings and proper ventilation. 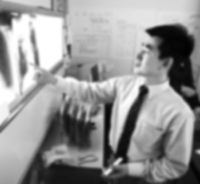 Light colours do not absorb as much sunlight as dark colours do, thereby reducing the heat. According to a report of Environment Protection Agency (EPA) 2005, using light-coloured concrete has proven effective in reflecting up to 50pc more light than black asphalt. Vegetation has a cooling effect due to evaporation from its leaves in response to heat, just as perspiration cools our body. According to a study published in 'New Scientist' vegetated and tree areas are up to 12C cooler than the city centres and growing more trees and creating more parks in urban areas can cool the cities up to 4C. Trees should be grown along streets and near houses. People should taught to grow vegetation on roofs, called green roofs. Modern green roofs trend began in Germany and Switzerland in the 1970s. According to a study done by National Research Council Canada in 2002, at the temperature of 35C, the traditional rooftop temperature is 70C and a vegetated rooftop temperature is 25C. Growing greenery on the roof insulates the building and serves as pollution filter having an indirect impact of cooling. This will significantly (up to 10-15pc, according to EPA) reduce the requirement of building air-conditioning thus saving energy as well as greenhouse gases emissions. Although these urban heat island mitigation techniques are humble they do play a role in improving air quality, cooling the urban environment and reducing urban electricity demand for an already energy deficit country like Pakistan. We must change our mindset to live in a warmer world. Growing crops and vegetables on rooftops, pathways, roadsides and every possible place in a city may not only help to offset the effect of rising temperature but also play its part in meeting the food requirements of increasing population of our country. Crop yields are diminishing due to reduced water supply and loss of soil fertility - products of global warming. The idea sounds eerie but we do not have much choice while adjusting to warmer climate. We cannot afford to sit by waiting for government to save us from roasting in the heat. We have to start thinking innovatively and more pro-actively. During the fiscal year 2009-10, the Federal Board of Revenue (FBR) failed to meet the tax-to-GDP target of 9.2 percent set by the International Monetary Fund (IMF). It barely achieved 8.9 percent. As usual, lame excuses were given by FBR stating 'the tax-to-GDP ratio could not improve from the previous fiscal year due to lower revenue collection because of the country's fragile economic conditions'. While addressing members of the Karachi Chamber of Commerce and Industry the other day, chairman FBR did not mention the actual reason that the rich and mighty are not taxed and there is no political will to crack down on the underground economy. It is tragic that in a country where billions of rupees are made on a daily basis in speculative transactions in real estate and shares, tax-to-GDP ratio is pathetically low. The Government seems least bothered to tax undocumented economy and benami transactions. The mighty sections of society are engaged in these transactions and FBR seems to have no will to tax them. It exposes the institution's inability to tap the real tax potential of the country, which is not less than Rs. 4000 billion. For example, the definition of business given in the Income Tax Ordinance, 2001 covers 'adventure in the nature of trade' and yet our tax machinery is sitting idle causing colossal loss to the national exchequer by not bringing adventures in the nature of trade in real estate into tax ambit. Our tax-to-GDP ratio can rise to 20pc in one year if we tax speculative dealings in real estate. This will also help in promoting construction industry as prices of land will come down and bring black economy into the tax net. Instead of performing its prime duty, that is levying tax where it is due, the FBR is busy in constituting committees to ponder over drafting of tax codes and formulating a long-term national tax policy -- these are the jobs of Parliament. It is clear that the FBR is more eager to do the job of legislators rather than performing its primary function of levying and collecting taxes. In recent years, many task forces were formed by FBR to suggest measures for improvement in tax-to-GDP ratio. These task forces did not suggest anything practical. Though they were given a mandate to analyse performance of the existing tax system with particular emphasis on broadening the tax base, no valuable study has been produced despite a lot of money being wasted. The fact remains that we have declining trends in tax-to-GDP ratio. If the present policies continue, we will have to wait for many years more to come up to the level of many developing countries, what to talk of developed ones. This is indeed a sorry state of affairs. The root cause is FBR's unwillingness to do what is its duty and indulgence in activities that fall outside its mandate or domain. At the end of the five-year Tax Administration Reform Project (TARP), the tax-to-GDP ratio dipped to 8.9 percent from 12 percent before TARP. The borrowed funds of millions of dollars have been ruthlessly wasted. The Standing Committee of Parliament on finance must conduct a thorough probe into the matter and seek the assistance of tax experts to determine the amount of loss caused to national exchequer by the FBR stalwarts during the last two decades, especially re non-collection of taxes where due and illegal exaction when nothing was payable. Note: The higher ratio for the industrialised countries is primarily due to the higher level of revenue from social security, payroll taxes, corporate taxes and taxes on domestic on consumption while the taxes from international trade and non-tax revenue are lower. In contrast, in the developing countries the major portion of revenue comes from the indirect taxes, particularly the taxes on international trade and domestic consumption, while the direct taxes have a lower share. Pakistan GDP-tax -ratio is even below than Sri Lanka and Thailand, which proves beyond any doubt the failure of fiscal managers and tax collectors. Despite spending millions on media campaign, FBR could not compel 15-20 million potential taxpayers to file tax declarations by the extended date -- 25 January 2010. The majority of non-filers and under-filers are rich and mighty civil-military high-ups, corrupt politicians and unscrupulous businessmen. FBR is levying indirect taxes and not imposing progressive taxes -- thus favouring the rich and over-burdening the poor. Indirect taxes are collected from the people but not deposited in government treasury -- courtesy unholy alliance between tax machinery and business community. Inefficient and corrupt tax apparatus is the root cause of the present scenario. Tax officials persistently and ruthlessly squeeze and penalize existing honest taxpayers while collaborating with tax evaders and avoiders -- massive over and under invoicing is not possible without their criminal culpability. The small business houses and salaried persons, already heavily taxed through withholding tax mechanism, are victims of their highhandedness. It is high time that the FBR should put its own house in order and tax the rich and mighty tax evaders and avoiders. It must tell the nation through media or submitting a report in Parliament how many high-placed bureaucrats, parliamentarians and businessmen, including their dependents, are paying mobile bills of over Rs50,000 in a year, but not paying any income tax. They must be asked about the sources from where they enjoy a life of luxury whereas the poor are dying of starvation and untreated diseases. The writers, tax lawyers, are members of Adjunct Faculty of Lahore University of Management Sciences (LUMS). It is the first time urban-based communities and ruling elite are feeling serious threat from terrorism and suicide bombing. In this backdrop, we have very weak political consensus o this issue. If we review and evaluate honestly the internal dynamics of political processes and link it with the perception of decision-making class in the country; lots of internal and external contradictions towards the war are very vivid. The two major political parties' leadership -- PPP and PML-N -- are jointly involved to deal and eliminate terrorism in the country. Within political parties senior officials have openly criticised the strategy on the war on terror. Some TV talk shows have made common people confused about the government's direction. Party officials, not just from two major parties but also from others such as ANP, JUI-F, and MQM, are taking lines different from party policies. Political parties like Jamaat-e-Islmai, JUI-S, Pakistan Therik-e-Insaf (PTI), and other religious parties have different stance as compared to the state and government. These forces claim the war is only serving the US's interest and the state is being used as a political tool due to international pressure. The PPP and PML-N are blaming each other of having close links with banned religious organisations. Both the parties criticise each other for getting political support from banned organisations during the election campaign. The banned organisation chief, Maulana Ludhianvi, claims that fifteen to twenty national and provincial representatives from mainstream parties like PPP, PML-N and, PML-Q have reached assemblies with the support of their voters. This confusion about the question of ownership of the present war is not only linked to political forces but also to the intelligentsia. In Punjab, the term Punjabi Taliban is not new. Prominent government representatives, including interior minister Rehman Malik, claim that most of the incidents are linked with Punjabi terrorists. I cannot say about the Talibanisation in Punjab, but I am fully convinced that religious extremism is higher in urban areas not only in Punjab also in the whole country. All these factors are directly linked to state and government's political and administrative polices and cannot be seen in isolation. Highlighting the issue of political fundamentalism and without resolving the issue we cannot fight extremism in the country. Political fundamentalism means the failure of the state and government to provide basic rights and needs to the people. Who is facilitating militants or non-state actors or individuals through huge financial assistance and heavy weapons for terrorist activities remains unanswered. If the support comes from external forces then why are we not raising the question? United State's senior officials have already admitted of getting logistics support from Pakistani officials. The parliament passed resolutions against drone attacks but we didn't follow the question of supremacy of the parliament and parliament is also silent. These types of ambiguities and contradictions create more confusion in the country and people are in doubt because of these actions. We should also admit that militants in Punjab are using class-based issues and using emotional tactics. Since the state and the ruling elite are not clear on the issue a majority of people have reservations about state policy. Political consensus always comes through a political process, institutions, and larger consultations with different stakeholders. There's a big trust deficit between the state, government, social and political institutions and among citizens, on the credibility and transparency on decisions of public and country interest, including war and terrorism. Ambiguities always create confusion and contradictions and, currently, we are observing these contradictions. No one takes responsibility and accepts mistakes for the betterment of society. On the one hand, we blame non-state actors, and on the other, we also criticise India and Afghanistan. Observing the political and military leadership strategies it is clear that there is lack of commitment and coordination between the two major stakeholders which is becoming very critical. This shows that the whole issue is being dealt in administrative context and not in political context. To deal with suicide bombings, we need a strong political strategy through political consensus and avoid decisions without understanding the local and regional dynamics and their implications. After 9/11, our ruling elite found itself in a weak position and did not have a strong standing before international forces. So, if we want to deal with the war on terrorism with an effective strategy, we should admit that we are on the wrong track. We need a strong political consensus and need to take into confidence social and political institutions in the country. The major question is whether Americans will allow us to develop political consensus? The answer is critical because America is moving with a wrong strategy in the name of war against terrorism in Iraq, Afghanistan, and Pakistan.